Last Monday, Dunes Golf & Beach Club closed temporarily. Steve Hamilton, the course superintendent ordered his staff to relocate their heavy machinery, as well as their golf carts on the 14th fairway, where he thought, will be safe from falling trees and flooding. Hamilton then proceeded to close down the Myrtle Beach golf course, which overlooks the Atlantic Ocean and told the employees that he will contact them once the Hurricane Florence has died down. Once they receive that call, the staff will rush to prepare the course and make it playable at a time when these places are usually filled with countless golf players. Hamilton said that it is quite unfortunate that storms usually hit during the fall season. Living near the beach does not have that many drawbacks but that is definitely one of them. Hurricane Florence, which turned to a category 2 storm, moved slowly toward the North Carolina coast northeast of Myrtle Beach at a pace of 105 miles per hour winds. 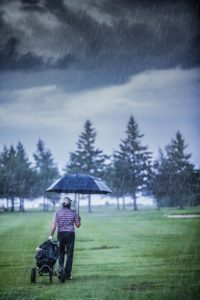 Although the majority of golf courses within the Myrtle Beach area remained open within the 2 weeks of Hurricane Matthew last 2016, it won’t be the same with Hurricane Florence. The latter has been forecasted to bring a 13-foot ocean surge as well as flooding rains. The golf courses in Myrtle Beach accounts for 50% of the $2.7 billion in economic output which golf generated for the economy of South Carolina in 2015. The numbers were based on the report of the state’s Department of Parks, Recreation, and Tourism. In case storm cleanup keeps the Myrtle Beach golf courses closed, it will surely have a significant impact on restaurants, hotels, as well as the tourist economy of the whole area. This would be very painful since cooler temperatures make the month of October the best season for playing golf. The executive director of the Carolina’s Golf Course Superintendent Association trade group, Tim Kreger, said that hurricanes pose some dangers to golf courses in coastal areas. Myrtle Beach golf courses could be left awash with salt water due to storm surges. They may also be covered with silt and leave the grass damaged or dead. Extensive cleanup may be required for fallen trees as well as freshwater flooding even if these did not cause any problem to other infrastructures like golf clubhouses. South Carolina’s Golf Association executive director Biff Lathrop said it is still a “wait-and-see-moment” for Myrtle Beach golf courses.